Home Baby Breastfeeding Can you Consume Fish Oil During Breastfeeding? Are you planning to take supplements while you are breastfeeding your baby? Are you thinking of having fish oil as an added supplement but are not sure if it is safe? There are many benefits of fish oil intake while you are breastfeeding your baby. Can you Consume Fish Oil During Breastfeeding? Read on to know more about it. Both you and your baby can have many benefits if you consume fish oil while you are still breastfeeding. Fish oil contains omega 3 fatty acids such as DHA, which get absorbed in your breast milk and are carried through to your baby when you are breastfeeding him. You can safely consume fish oil if you are not allergic to fish or fish based products like fish oil and another omega 3 fatty acids (1). How Does Fish Oil Benefit My Baby? Omega 3 fatty acids contain a very good amount of DHA, which is extremely important for your baby’s development and growth. DHA helps in boosting the development of your baby’s cognitive and social skills, as well as language skills. It helps strengthen your baby’s immunity and improves your baby’s digestive system as well. DHA also plays an important role in making your baby’s skin and vision healthy (2). Essential fatty acids (EFA) help in the production of prostaglandins. These help keep inflammation in check. It also improves immunity. The essential fatty acids help regulate proper growth in your baby. It aids the neural and sensory development in your baby. In some babies who have a slower developmental and growth record, conversion of EFA to its active form can be a little difficult. Intake of DHA in the form of fish oil during breastfeeding is very important, as it helps the conversion of essential fatty acids to its active form (3). During the first year of birth, your baby’s brain grows almost triple in size. The essential fatty acids that transfer from your breast milk will help in the development of your baby’s brain. Fish Oil For Breastfeeding Mothers – How Beneficial It Is? Fish oil contains omega 3 that is extremely beneficial for you as it is a heart-healthy fat. According to the La Leche League International (LLLI) (4) if you regularly have omega 3 it can help fight depression and uplift your mood too. 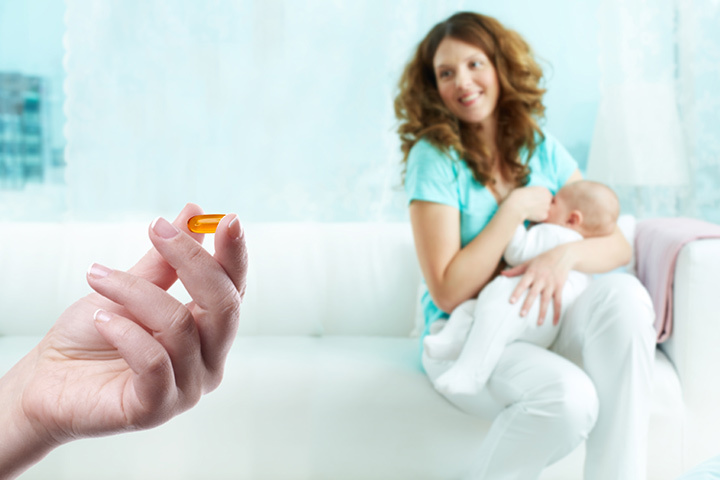 Fish oil is surely beneficial for both you and your baby while breastfeeding, but an excess intake can be harmful too. Your doctor will advise you about the daily dosage. Fish oil supplements are available in doses of 300 to 500 mg. Therefore, you can easily regulate your dosage as per your doctor’s recommendation. In some cases, these supplements in capsule form can cause a feeling of bloating or even cause burps that smell of fish. You can freeze the pills before swallowing and have them with a meal. One supplement you should definitely stay away from while breastfeeding is cod liver oil supplements. It contains an excess of vitamins A and D and can harm your baby. If you have a bleeding disorder, an intake of fish oil can aggravate your condition. Avoid taking fish oil if you have diabetes or hypoglycemia (5). Be extra cautious about consuming fish oil if you have low blood pressure, cholesterol issues, asthma, heart issues, and liver disease or a family history of colon cancer. Consult your doctor before you add any fish oil supplements while breastfeeding. Monitor your health while you are taking fish oil. If you feel any discomfort, make sure you speak to your doctor immediately. If you have experienced the goodness of taking fish oil while breastfeeding, please share your advice here. Above article was about Can you Consume Fish Oil During Breastfeeding? Previous articleHow to find Is It Safe To Use Marijuana While Breastfeeding? Next articleFacts About When Can You Expect Your Next Period After Breastfeeding?